7 sprigs of fresh thyme, stripped thyme flowers removed and set aside for garnish. 2 Put the asparagus and the pointed red pepper in a press and seal food bag with the olive oil seal and massage in to the asparagus and red pepper. 3 Preheat a griddle pan on a medium to high heat. 4 When the pan is hot, place the asparagus and red pepper into the pan. Turn frequently until cooked. When cooked set aside to cool. 6 Mix the garlic leaves into the quinoa, then place on top of the rocket and add the tomatoes. 7 Slice the red pepper into chunks and cut the asparagus in half. 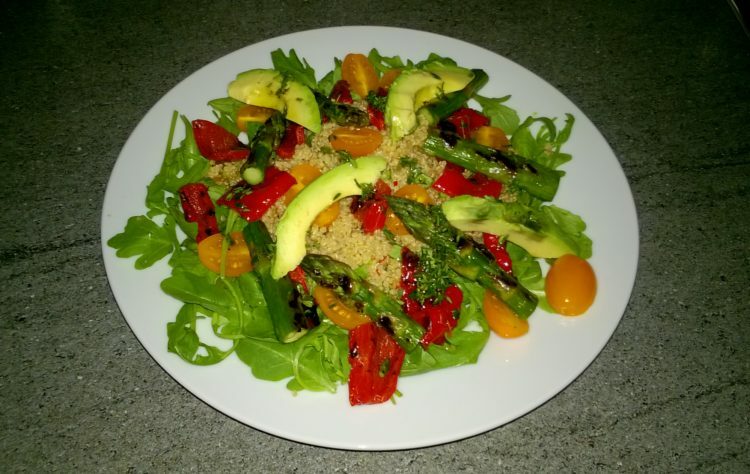 8 Add the red pepper, asparagus, and avocados on top of the salad on the plate. 10 Garnish with the thyme flowers and serve.